The Venue was a live music club at 160–162 Victoria Street, London, England, owned by Virgin Records. It opened its doors on 1 November 1978 and operated until 1984. The first act to play there was Graham Parker and The Rumour, followed by the last live performances by Alex Harvey before his death. Todd Rundgren played some dates there just before Christmas in 1978, as part of the tour to back up the Back to the Bars album; released for the Christmas market, at the time. Two shows were sometimes played per night, and the ambience was akin to a nightclub, where audience members sat at tables and could have drinks and meals while listening to the acts. It was also popular for use by record companies showcasing new signings to the music media. ^ a b Grundy, Ian; Roe, Ken. "Metropole Cinema". Cinema Treasures. ^ a b c d e f g "The Venue". Create Victoria. ^ "Alan Vega - Live Music". 45worlds.com. Retrieved 18 July 2016. ^ a b "U2 Victoria, 1979-12-18, The Venue, Early Days — U2 on tour". u2gigs.com. Retrieved 3 April 2015. ^ Sutherland, Steve (29 June 2011). 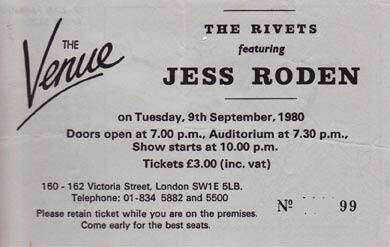 "Kajagoogoo Early Gigs 'The Venue' London". KajaFax. Retrieved 18 February 2013. ^ "Merger - Live At the 'Venue' Victoria 1981". Amazon. Retrieved 3 April 2015. ^ Jago, Andy. "1979-2000 history by andy jago". familybandstand.com. Retrieved 2 December 2016.